Your belongings are important to you; you aren’t going to trust them to just anybody. You want to make sure that they are cared for, protected and well-maintained, especially when you are considering placing them in a self-storage facility. But not all self-storage facilities are created equally. There are certain indicators you are advised to keep an eye out for when deciding who and where to trust with your property. Below are a list of some of the things to look out for when choosing a self-storage facility. The first time you get in touch with a self-storage facility and that first interaction you have with an employee will tell you a lot about how that company values your business. Friendly, helpful and professional customer service is a good indicator that the self-storage company you are inquiring about will look after your items as if they were there own. A manager who is aware of the goings-on around the facility and who is intimately familiar with all of the protocols, technology and security procedures is important. Management sets the tone for the rest of the company’s employees and a diligent manager who knows the ins and outs of the business is a good sign that you are doing business with a meticulous company. How well-maintained the facility is says a lot about how well-kept, functional and reliable their security measures are, and how vigilant they will be while your belongings are in storage. Professional-looking staff and grounds say a lot too. If you are checking out a storage facility and notice insects, rodents or rodent droppings, there is a good chance that the people running the business are not all that concerned with making sure your belongings are well looked after. Pests can wreak havoc on your stored items, especially rodents. Don’t settle for anything less than a pest-free environment. This means security personnel who look are vigilant, who monitor the people coming and going from the facility and who ask the appropriate questions of people who may not belong in the facility. Guards on their phones or constantly socializing are not going to do an adequate job of making sure your storage unit is protected. 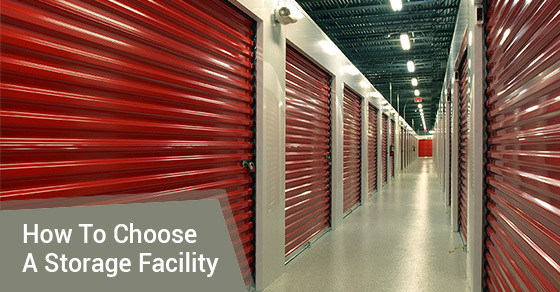 There are a myriad of storage facilities to choose from. Whether you are storing items with high commercial and monetary value, or things you simply don’t have room for in your business or home, it is important to make sure that you are dealing with people who value your business and treat your possessions well.